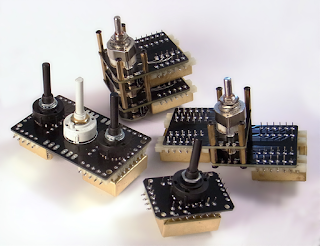 I now have finished versions of 4 different types of "turnkey" autoformers that wire up with three connections per channel (In, Out and Ground). The Elma Switch versions have Deep gold plated circuit boards for the switch contacts which then directly connect to the pins on the autoformers. They come in 24 and 47 position versions and can be stacked for stereo or balanced operation. The single 23 position mono unit can be wound with any taper that is desired and the version with 3 switches pulls another trick out of the bag. 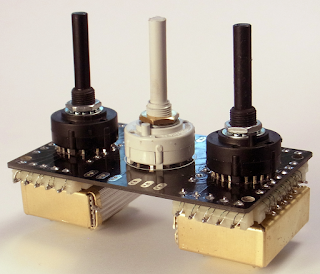 This version consists of a pair of 23 stepped units that attenuate form 0 to -52.5dB in 2.5dB steps for left and right and while 2.5dB is a bit coarse for a balance control the center knob comes to the rescue with the ability to shift the balance left or right over a 5dB range in 1.25dB steps. This in conjunction with the independent 23 position controls allow for any shift to be set in 1.25dB steps. I'll be updating the Intact Autoformer page in the next few days with priced and clickable purchasing options.